Games and game theory crop up frequently as topics in conflict resolution literature. Games, after all, are a great tool for teaching conflict resolution theories and skills, and game theory, which utilizes mathematical formulas to predict and understand complex human behaviors, can help shed light on conflict and collaboration. I have several links to share with you for game and game theory enthusiasts. First games, then game theory. Bill Warters, the author of Campus-ADR Tech Blog, has an enviable knack for discovering great web sites. Case in point: Bill recently blogged about the Distributive Justice Interactive Web Site, a fascinating project which examines notions of justice and fairness with respect to the distribution of goods and resources. It includes a game in which players can create their own distribution model. (Click on “enter” at the main page and place your cursor over the image of the gear.) You can also complete a survey, read about theories of distributive justice, or subscribe to the project’s newsletter. There are some interesting insights into gaming in an essay by Katrina vanden Heuvel, editor of The Nation, which challenges the commonly held belief that video games are vehicles for promoting violence, and describes ways in which games instead are used to teach empathy or build understanding of other cultures. This essay includes a link to Water Cooler Games, a forum for video games designed for purposes other than entertainment, which in turn leads you down the rabbit’s hole of gaming sites and other articles. This led me to The Better Business Game, in which players wrestle with social and environmental issues in the context of running a business; and the United Nation’s World Food Programme’s Food Force, in which players participate in 6 missions to address hunger in troubled regions. There is also an article by Todd Sandler, “Counterterrorism: A Game-Theoretic Analysis,” which appeared in the April 2005 issue of Journal of Conflict Resolution, which can be downloaded in PDF format by clicking here. 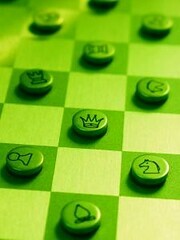 This entry was posted in Conflict Resolution, Cool Stuff on the Web, Game Theory. Bookmark the permalink.